When I visited Shangri-La’s Ting at the Shard recently with my beau and my parents who had come to visit, my dad made a comment which stuck in my mind. Despite ‘only’ being on the 35th floor of this over-300m-tall and with that tallest building within the EU (the viewing platforms are located at floors 68, 69 and 72), as we got off from the elevator and entered the reception hall, the London view was breathtaking. We hardly had to wait at all until we were called forward and took our place at our window table (on a side note, they cannot guarantee window seats, but do make the request and they will try to accommodate it). It is then that my dad remarked how the London view from this height could almost be compared to a multitude of Lego blocks, which he could pick up and place at the edge of the river Thames, giving them a slight nudge so that with a soft splash they would drift away and into the distance. Thus imagined my dad sending Tower Bridge on a journey, which in reality during our afternoon tea extravaganza was solidly in its place, to be bathed in hues of grey, blue and violet as we progressed throughout the afternoon and into the finally dark but magically lit evening. This may be a good reason to reserve a table at 4pm (their final call) during mid-autumn just after the switch back from daylight saving time. Profit not only from the tea but also come for the changing view. 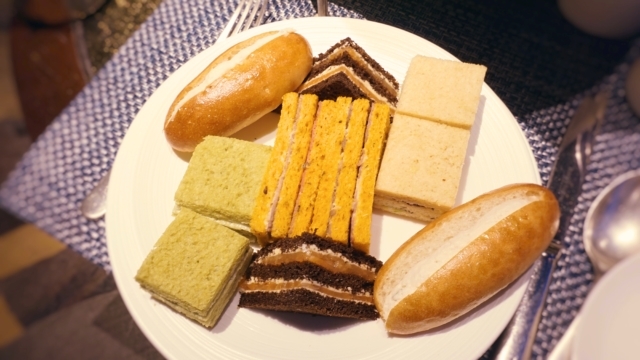 If you or anyone in your company opt for the Asian-inspired afternoon tea ceremony (at the time Japanese-inspired), be prepared for a photogenic moment as the waiter brings in a tea tray with delicate cups filled with clear-green Japanese Sencha, lifts his finger in anticipation, pours water into the tray – and voilà! – there it is, your own personal and magical fog on a clear London day, fog which will stream down and invite you to grasp it as you would want to try and clasp cotton candy clouds. You will have probably encountered this dry-ice method for dramatic effect in theatrical productions, films, night clubs or even desserts as sometimes seen on TV. The transition of a substance from the solid to the gas phase without passing through the liquid phase, otherwise referred to as sublimation, is accelerated when water and dry ice meet, creating dense, low-sinking clouds of smoke-like fog. And aside from this being an exciting, sensual experience in itself, it will also have cooled down your mellow Sencha tea, accentuating all the sweet and refreshing nuances in flavour. A very impressionable but far too short special Sencha spectacle indeed. Of course there were other teas available as well and a fairly good choice at that – signature blends and beautiful skin teas, a China White Monkey and a Very Berry – the list goes on. Refills of everything were included in the very extravagant price. If you are a sweet tooth and pastries is one of the things that get you most excited about afternoon tea, the classic version might just be your safer choice. 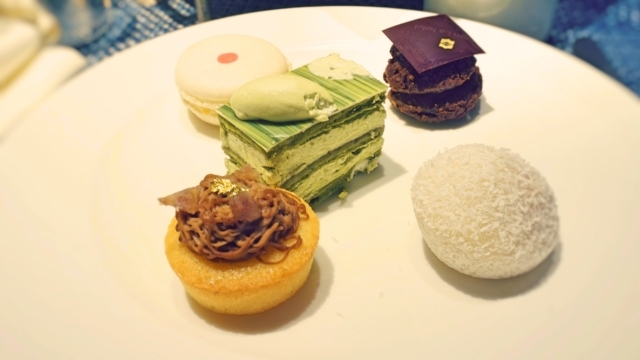 Flavours and textures were more delicately balanced and diverse than could be said of the Japanese-inspired treats. 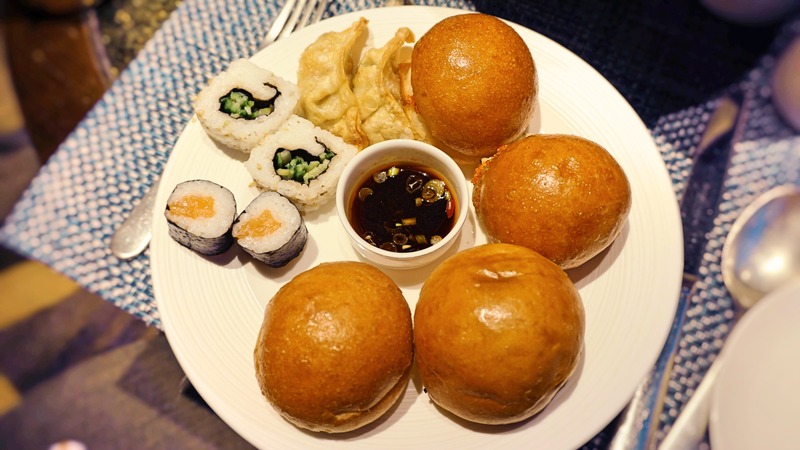 However, the Japanese-inspired sandwiches offered more exciting alternatives to the traditional ones: toasted sesame seed rolls with tuna and wasabi mayonnaise, cucumber and sesame uramakis, etc. As for the scones, a thickly clotted cream and strawberry (classic) or orange and yuzu (Japanese-inspired) marmalade were a solid accompaniment to solid (but not blew-me-away) scones. They were kept warm. In napkins. Which sadly for me was a trade-off between availability and warmth – one in which I would have preferred to see warmth winning. 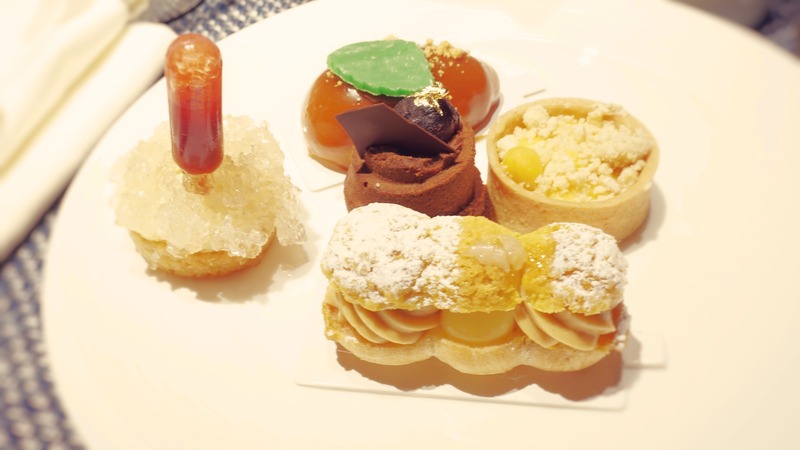 But if anything won that evening it was the Sencha performance and ‘Lego view’ – so come here for the experience and take your friend so that you both may also enjoy the French-style delicate pastries of the classic afternoon tea!